What states do we service? For all of your produce, frozen or protect from freeze (PFF) loads, DTL Transport has industry leading climate controlled vans to ensure your cargo's integrity has the highest priority. 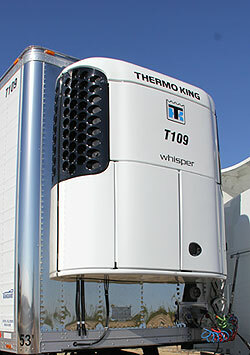 All company owned trucks are installed with new Thermo King Whisper TRUs. The average age of our TRU’s is less than a year. With respect to the new California laws in effect, DTL Transport also registers all company owned TRUs and will provide an ARB number on request to its customers. DTL Transport takes great pride in making sure that the dry freight being hauled is handled with the utmost importance and delivered on time. The average age of our van/refers in our fleet is less than 2 years. Please contact one our professional dispatchers to get a competitive quote for your dry freight needs.